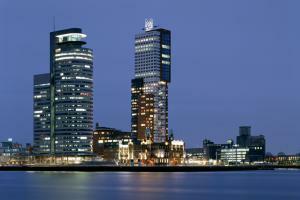 Rotterdam has undergone a transformation in recent decades. A city in which the development trend when it comes to modern architecture. In Rotterdam buildings where people in other cities can only dream of. The Wilhelminapier is the best example with new high rise residential towers like the Montevideo building. The most striking example is the Wilhelmina Pier Rotterdam Manhattan on the Maas, an area that has become an absolute prime location. Trendy hangouts, work, live and relax in one location. Everything within reach: city in the city . The acceptance level of Montevideo for Dutch standards are rather high. It shows itself in the chic material user, in transparent design in the playful, varied facades. In both towers of Montevideo are luxury apartments, 192 in total with quit some furnished rental apartments available. The lower middle part of the Montevideo building is almost entirely reserved for offices and Excellent Health Club (swimming, fitness and sauna) which is included in the rent, the rest of the building is equipped with luxury apartments. The ground floor of the building accommodates a busy boulevard walked, with terraces facing south overlooking the water. All Montevideo apartments are 2 bedroom apartments. Please contact our office for the availability, we have Long Stay and Short Stay apartments to offer.